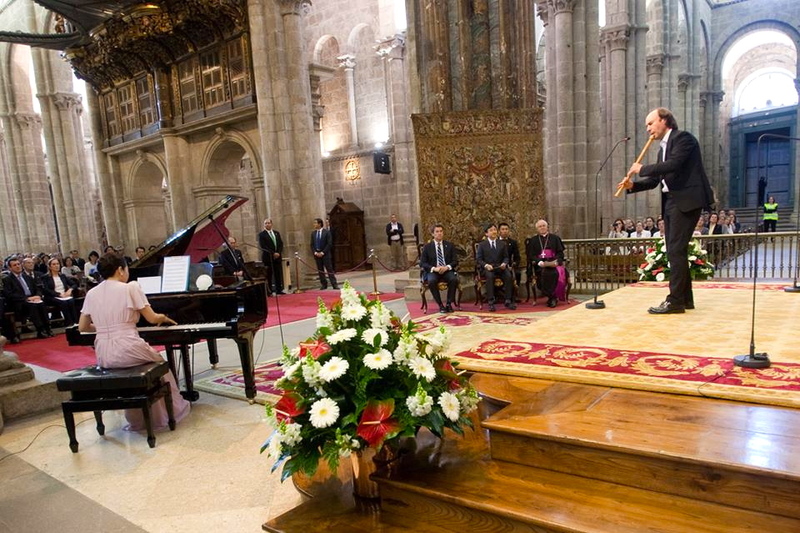 As a finishing touch to your bridal, Naruhito attended a concert in which the Galician bagpipe and piano Carlos Nunez Mine Kawakami have played with great solemnity in a silent Cathedral of Santiago. Thus, Carlos Nunez has played with flute and bagpipe songs Calixtino Codex pilgrims, the ‘Cantigas de Santa Maria’ composed by King Alfonso X the Wise and the ‘Salve Regina’ of San Pedro de Mezonzo, which has started a loud ovation. Beside him, Pancho Alvarez has played the hurdy-gurdy, Adrian was responsible Regueiro organ while Xurxo Nunez has played the drum and has even dared with one made with scallop shells. For its part, the pianist Mine Kawakami – whom Nunez presented as “a great admirer of Galicia and Galician speaking” – has run the official theme of the Year Dual Spain-Japan, ‘Spirit’ has been applauded vigorously. A piece that the artist has sought “to bring to Japan” to attendees to bring them back to Santiago in a way “very long”, in his own words. The concert ended with the blessing of the Archbishop of Santiago, Julian Barrio, the pilgrim who “came to see the tomb of St. James’, who wished them a pleasant journey back. The event, have come, like the rest of the day, various authorities as the Minister of Development, Ana Pastor, the president of the Xunta, Alberto Nunez Feijoo, the Government Delegate, Samuel Juarez, or the mayor of Santiago, Angel Currás. Previously, the official meal on Saturday, President of the Galician government, Alberto Nunez Feijoo, has shown “respect and admiration” for the prince and Japanese culture, while it has shown interest in “wanting to prolong” the relationship between Galicia and Japan routes marked by Santiago and Kumano, which “are proof that love does not know the roads latitudes”. The food menu official reception on Saturday was made up of various Galician products. Thus, after a lobster salad is served Celeiro loin, sirloin Galician, while desserts are Santiago cake and ice cream Cebreiro cheese. This entry was posted in Camino Inspirations! and tagged camino, culture, history, music, traditions. Bookmark the permalink.